Alkoholmåler/Alkometer 0-100% med målebeger. Benyttes for å måle alkohol i etanol/vann blandinger. Ceramic Boil Enhancers 30gram Hjelper i starten av kokeprosessen for en jevn kok. Tilsettes i mesken før man starter å koke. Duo Vannrenser, benyttes sammen med aktivt kull for renser vann eller andre væsker. Fast, clean, easy to use. Contains one replacement cartridge for EZ Filter System or EZ Inline Filter, specifically designed for the maximum purification of alcohol or water. Laboratory tests prove that the carbon improves the spirit from the T500. It's important to still carbon treat when using the T500 in order to get the very highest quality finished spirit. The cartridge eliminates the need to handle powdered or granulated carbon. 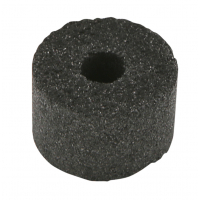 The cartridge's porous design allows the spirit or water to pass through and the unwanted flavours or chemicals to be absorbed by the activated carbon. It is fast, clean and easy to use. Each cartridge is suitable for one batch of alcohol from a 25L still or 300L of water. T500 kokekar med lokk og pakning. Make gin with the Gin Botanical Basket! Simply run your spirit wash through the still as normal, filter it and water it down to 40% ABV. Then put your botanicals ingredients into the basket and screw the basket on to the Alembic Pot Still dome and condensor or T500 condenser (by removing the saddles) and run your spirit through again. You can also use the Botanicals Basket to infuse your spirit with other flavours e.g. citrus or elderflower for your own unique brand of spirit. Raschigringer i kobber, 100gram. Copper is required as a catalyst to remove sulphur odours during distillation. These are essential for high alcohol washes, typically over 16% ABV. Pakning til lokk grainfather og T500 kokekar. Lokk grainfather og T500 kokekar. Obs pakning følger ikke med. Perfekt utgangspunt for å kunne lede dampen fra bryggingen ut.